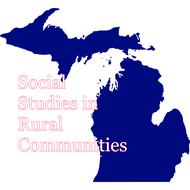 This group was founded out of a desire to create a collaborative community for rural Michigan Secondary Social Studies instructors. Many of us teach in settings where we alone are the Social Studies Departments at out school. We often have much smaller class sizes then a typical classroom. Perhaps more importantly often have a blended classroom of ability levels and socioeconomic situations that would typically be split into seperate bands/groups in a larger district. We hope to use this space to share and grow strategies, lessons, and resources that we have found success with in our individual schools and ISDs.